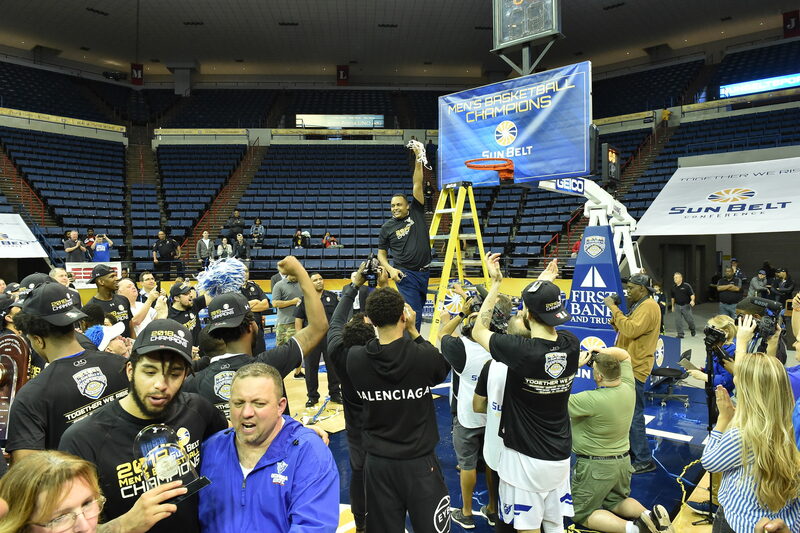 Head coach Ron Hunter of the Georgia State men's basketball team holds the net after winning the conference championship. Submitted by the Sun Belt Conference. Georgia State enters the postseason on a four-game winning streak and Sun Belt Conference tournament championship. They never trailed over the three-game stretch. The last time the Panthers made the tournament was in 2015 when they ruined brackets by defeating Baylor as a 14 seed. This year, the team from downtown Atlanta feels even more confident. “We definitely want to leave our own legacy. We feel like we’re just as good, if not better than the team that came before,” Simonds said. Coming into the NCAA Tournament, Georgia State (24-10) is showing exactly who they are– hard-nosed on defensive, accurate from deep and reliant on Sun Belt Player of the Year, D’Marcus Simonds. The Panthers’ brand of basketball wins at every level of competition: AAU, high school, non-Power 5, Power 5 and NBA. So does Cincinnati’s. Cincinnati (30-4) is second in the nation in both points allowed per game (57.1) and defensive field goal percentage (36.8). They also rebound absurdly well, by far Georgia State’s biggest weakness. Cincy grabs 13.1 offensive rebounds and out-rebounds opponents by 7.3 per game. Another major matchup problem for the Panthers is dealing with Cincinnati’s larger lineups. The Bearcats start four players 6’5” or taller and regularly play just two shorter. On the contrary, Jordan Session and Jordan Tyson are the only traditional-sized bigs the Panthers significantly play. However, that’s exactly how the Panthers can burn Cincinnati. Their small lineup plays into their layup, free throw or three-pointer offense. It’s without a doubt that the better offensive team hails from Atlanta. If Georgia State gets hot and especially from deep, the Bearcats could find themselves in deep trouble. D’Marcus Simonds’ ability to get good shots near the basket will of the utmost importance as it has been all season. It will be tougher to navigate through easily one of the biggest teams Georgia State has faced this season. The Bearcats being amongst the soundest in the nation will only intensify the challenge. If Simonds doesn’t score near his average of 21.1 points, Georgia State will more than likely have to play the defense that won them the Sun Belt Conference Championship. Their three opponents shot a combined 33.5 percent from the field. Their superior three-point shooting will also be a difference maker. “We’re not a regular three-point shooting team. Me, Devin Mitchell, Isiah Williams, we can all shoot deep. We can all shoot consistently,” said Thomas. Cincinnati owns the nation’s second best defensive field goal percentage with 36.8 percent. Offense isn’t a weakness for the Bearcats, but it’s their weakest spot. Their highest scorer is Gary Clark who averages 13 points per game. He is most likely to get the ball if Cincy goes cold because he shoots over 50 percent and has a knack for drawing fouls. Big guard Jacob Evans could also become an issue for the Panthers backcourt. The Bearcats high volume three-point shooters do not shoot over 40 percent from deep. The large frontcourt will make this task one of the toughest any team in the South Region faces. Clark leads this charge for Cincinnati averaging team-highs of 13 points and 8.5 rebounds. 6’9” Kyle Washington adds 10.9 points and 5.4 rebounds per game. The Panthers best chance at becoming Cinderella is by being an all-around team– exactly what they have done the last four games.